I like re-visiting old recipes, but we’ve rarely done it on HonestlyYUM. Today, we’re bringing back our conversation cardamom truffles. They’re so smooth and decadent and easy to make that we felt we had to bring them back! This time instead of flavoring them with cardamom we decided to make them boozy. 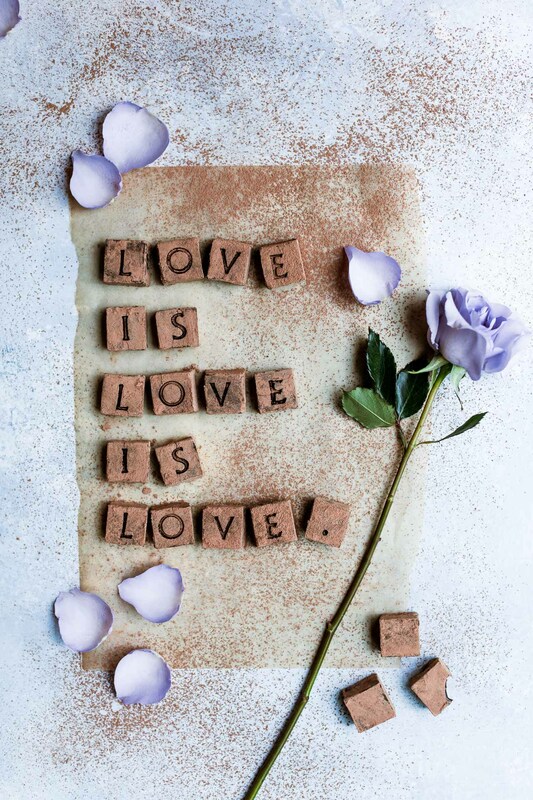 Because what’s more important on Valentine’s Day than cocktails and chocolates?! These truffles have Old Fashioned ingredients in them– bourbon, bitters and orange zest, all creating a subtle boozy tasting truffle! Combining two of our favorite things: chocolate and cocktails! Roughly chop chocolate and combine with butter and salt in a saucepan over low-medium heat until everything is melted. Place egg yolks in a small bowl and whisk. Slowly pour the hot water down the side of the bowl while whisking the egg yolks. Pour very slowly and in a thin steady stream while whisking so the hot water does scramble the yolks. Continue whisking until all the water is incorporated. Combine bourbon, bitters and orange zest on low heat until it is warmed through. Strain and whisk into egg mixture. Make sure to add the egg mixture into the chocolate while it is still warm. Toss the squares in a plate with the sifted cocoa powder. Stamp your message into each square! How did you engrave or stamp the letters? With food letters stamps! Got them on Amazon. These are THE BEST. I have made truffels several times now, but none of them have been so easy to make, so fun (egg yolks!) or so delicious. I already prepared them twice, they were great, all of my friends will now get them as a gift so I can make them more often. Aww, yay! You made our day, Yasmin!! So happy you gave them a try. Thanks for stopping by! Karen, I made these last week and they came out beautifully! 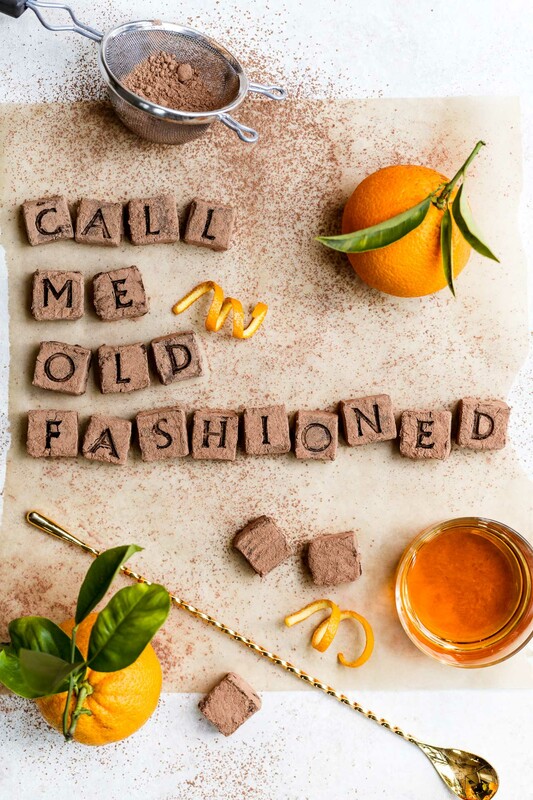 Loved the “old fashioned” twist – orange and bourbon go so well with chocolate! These are so unique and fun! They almost look like little runes! Oh wow, these look delicious! Beautiful shots too as per usual. I loved making your cardamom chocolate truffles from a few years back (I got so many complements on them and recipe requests!!!) that were of a similar vein so will have to give these a go too! How lovely this is ! Thank you so much for the idea !